The history of Pescarolo-based Melgari, in Cremona province, is the classic example of the “made in Italy” family business. Present on the market for four generations, it started out as “local” joiner’s shop. In the ’60s Melgari discovered the vocation for doors and windows, still keeping in its DNA a passion for product innovation and final quality. Today the company is led by Nicola, who has worked alongside his father Amilcare for some time. The company always pays great attention to technological innovation, guaranteed by the longstanding partnership with Scm Group, and the advantages guaranteed by software suited to the company mission. “We decided to make automation a big part of our process. Our SCM “Accord WD” machining centre has an automatic loading and unloading store, meaning that it can operate unmanned – you could say automatically… – for several hours. It’s basically a machining cell, which has let us really focus on versatility and precision machining of every profile, which can be done in two steps. The store, which Scm Group technicians designed for us, allows us to load workpieces with a maximum length of 2,500 mm, with an unmanned machining time of more than one hour. One feature that is very important to us is the possibility of easily extending the cell in future. Depending on our requirements or if the market becomes more favourable we may want to act to increase productivity”. How important is it to have specific software for door and window production? 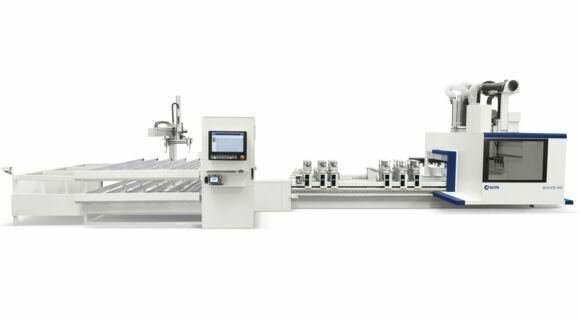 “For us “Xilog Maestro” is a convenient, powerful, versatile interface with the “Accord WD” machining cell and the entire robotised loading and unloading system. It’s really easy to control every operation “in the machine”, whatever we have to do, from routing a profi le to machining a complex 3D surface. As for design and instructions linked to door and window production, we work with specifi c software supplied by DDX. 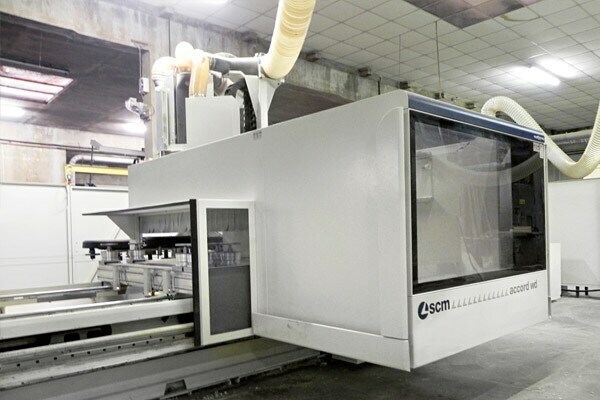 Design with “third party” software is managed without any problems by the machine, thanks to the “translation” which “MSL Connector”, the Scm Group proprietary software, performs by collecting all of the data needed for any machining and managing the machining centre’s automatic worktable. It’s a huge step forward compared with when the process of positioning workpieces on the machine and hold-down clamps was less fl exible and much more difficult for the operator”. So? What can be done? “We wanted to create a cell for doors and windows, a complete machining centre that produces profi les ranging from 68 to 98 mm. Technology has changed production, greatly speeding up some steps, with fewer people involved. I must admit, those decisions were hard, but they had to be taken in order for the company to survive. The crisis saw our output fall from 1,700 to 1,000 doors and windows a year. We’re focusing on versatility, on the possibility of making sixteen models of window with a single machining centre. At the moment we process 8-12 windows a day: the advantage of our “Accord WD” cell is that it never stops, even during loading and unloading. The worktable has 6.30 m of working space, so if the machine is machining on the left-hand worktable, on the right-hand side we take advantage of the automated loading and unloading. We also use the cell to machine solid wood or hollow core doors and even modules for curtain walls used in the construction sector. Technology is an opportunity, often the only one. We’ve always believed that, since the ‘60s, when my dad bought the famous Scm “System 1”. We have always invested in technology since then, following the development of demand, diversifying production.